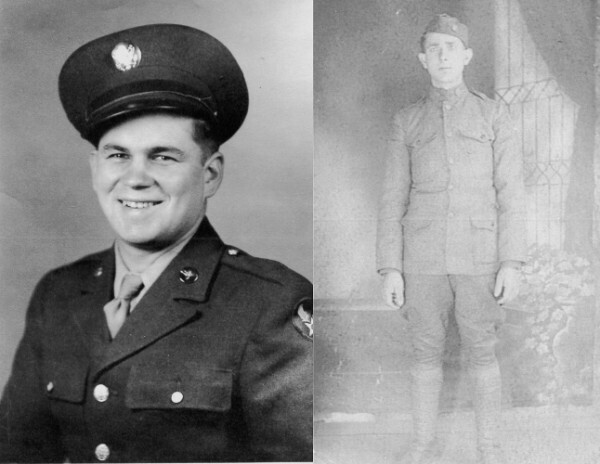 I got some new old pictures from Mom, among them these two of Grandpa G.I. and Great-Grandpa Doughboy. I’m the last person to cheerlead for the military*, or slap the “hero” label onto anyone who puts on a uniform, but I really love these. For one thing, it’s the first picture of Grandpa I’ve ever seen where he doesn’t look sick, exhausted, or simply henpecked. Well into old age, Grandma referred to WWII as “the time your grandfather ran out on me,” and said how happy he was to join up. He certainly does have a twinkle in his eye. He wasn't sent overseas, so I suppose he had as decent a time as one could expect. He used to tell about the time he was sick and his unit left him behind with a "colored" unit. Still blows my mind that the forces were still segregated at that point. I guess now I know where I get my eyebrows from. *I have been known, however, to whistle at the occasional ROTC boy in a sailor suit. So sue me.